Microfilm cabinets, shelving, and storage by Russ Bassett can provide high density micro graphics storage solutions. Russ Bassett is a company that manufacturers a wide variety of media storage solutions for Data media, Professional Audio-Video , and Micrographic applications. Their clients include top corporations, universities, libraries and government facilities. Russ Bassett products are distributed under the brand names Russ Bassett, Visu-Flex, Gemtrac, and ProMedia. Products are either drawer based or shelf based. They are available as dedicated units for popular media, insuring maximum capacity or as a flexible system that can be adjusted and or reconfigured to accommodate multiple or changing media collections. The drawer based products include small Visu-Flex stacking cabinets, Russ Bassett media-specific micro graphic cabinets and ultra-flexible ProMedia cabinets that can combine different drawer heights in the same cabinet to maximize flexibility for today’s and tomorrow’s mixed media collections. 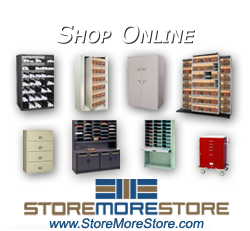 The shelf based products include Stationary Shelving, Slide-trac and Gemtrac. Slide-trac is space efficient side to side movable shelving and Gemtrac is hi-density pullout shelving with the patented overhead track system.